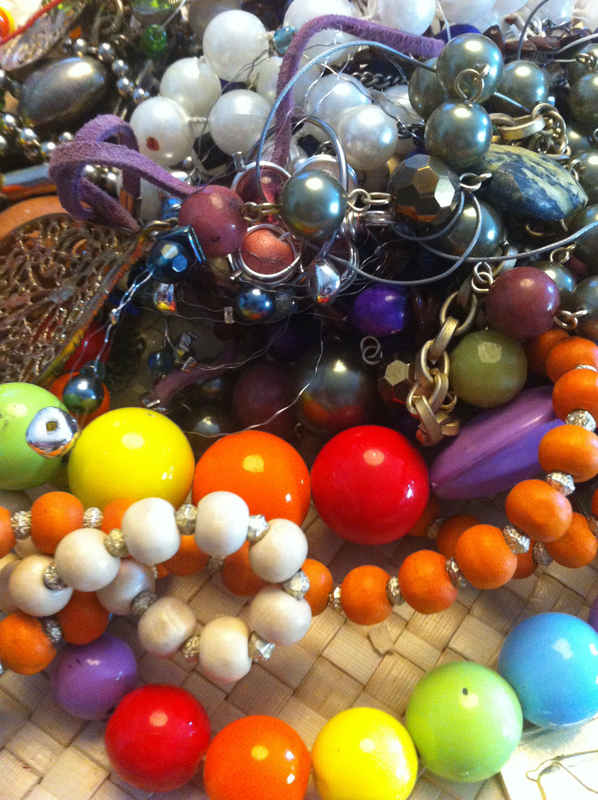 My last trip to the Value Village for 2013 yielded the first good bag of broken jewellery in a long time. Technically it was a vase filled with baubles, mostly unuseable. But beneath the Happy Meal Watches and Mardi Gras beads, some exciting finds were uncovered. The little gold-filled fob locket is what caught my attention in the first place. It has a lovely engine-turned surface plus it still has it’s original glass frames on the inside. I also found this pre-1950 Mexican silver pinwheel pendant brooch. It is signed CB Sterling Taxco and is set with abalone and matrix turquoise. It was missing two shell and one turquoise section, so I reset it with with some stones I had lying around. The pinback has also been replaced and the safety mechanism is missing from the clasp, but it is still works. 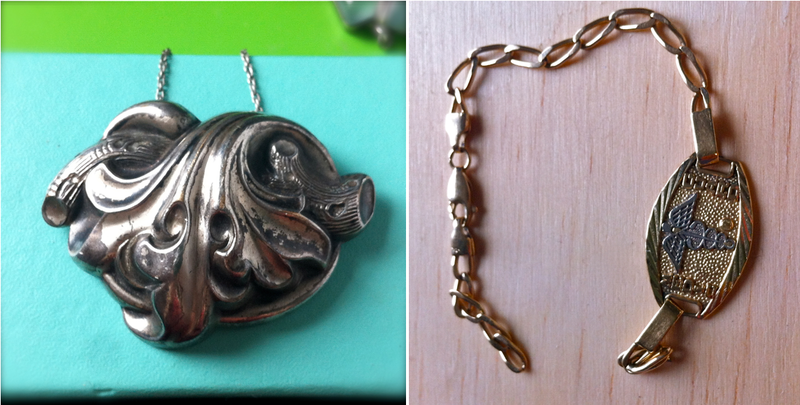 I also got a holloware, 1930s-era Victorian Revival Repoussé pendant. I’ve hung it from a sterling chain that was also in the bag, but I’ve done some research and originally it probably hung from a chain with glass bead stations. So I may try and restore it. The final score was the broken medic alert ID bracelet. It’s the first bit of gold I’ve found in a long time. And although gold prices are not as high as they used to be, I shall probably scrap it rather than fix it up. My list of repair projects is too long already.